Summer in Sydney can mean some pretty overwhelming heat. The temperatures here get into the high 30’s sometimes even 40’s (degrees celsius) which can leave everyone feeling pretty wiped out and groggy. My heat sensitivity which I talk about in this post Heat Sensitivity, Cold Sensitivity & Infrared Sauna Therapy has healed a lot over the years but I still tend to feel lethargic and foggy when temperatures are high. My main go-to’s for keeping cool have been cold showers, throwing myself in the ocean, fans, and an accessory I’ve come to love since being diagnosed - the cooling scarf. When I was at my sickest in hospital Ben bought me cooling scarves which I wore religiously around my head. The inflammation at the base of my head created a lot of heat and pressure and those cooling scarves were such a saviour. I remember joking that I looked like rambo as I always had one tied around the top of my head and one around my neck. But after a few Summers they started to smell mouldy because the crystals were locked inside the fabric, they weren’t separate, so we chucked them and I’ve been on the lookout for a better cooling scarf ever since. I recently discovered Koldtec’s Ice Towels and these little things are amazing! 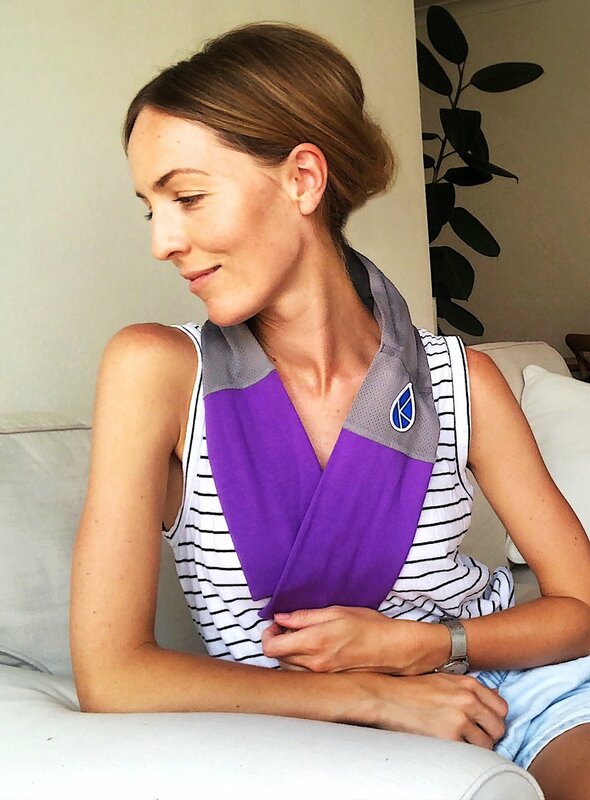 Mine has become so handy for me as it’s super soft and comfortable to wear, really well designed and the scarf is separate from the ice packs so no mould problems! The Koldtec Ice Towel has a compartment in the centre for ice packs to be slotted into. You can then tie the cool scarf around your head or your neck to help keep you cool all day. It comes with 2 dry ice refills. All you have to do is submerge these in water till they absorb the moisture which only takes minutes, then place the saturated ice packs in the freezer to freeze (I recommend putting them in a plastic bag first so they don’t absorb any smells in your freezer). Once the ice packs are frozen you can easily slot one ice pack into the scarf and wear it around your neck straight away. Then, when you need a new frozen ice pack you have a refill in the freezer to replace so your constantly cool which you can just keep on rotation. You don’t have to take the whole thing off and wait till it re-freezes again. Also, you never get wet! the ice packs hold the water in so you don’t get drenched every time you wear it. I love how I can throw the scarf in the wash at the end of a sweaty day without worrying about the ice crystals absorbing the water. The fabric is super soft and breathable bamboo which is “naturally absorbent and moisture wicking”. The soft bamboo also makes it easy and comfortable to tie around your neck and the design is stylish. Ticking all the boxes! I’ve been wearing mine around our hot apartment, to the beach, I even took it back to New Zealand with me recently, I’ll probably take it to work and I’m very temped to take it out walking with me. So, if your looking for a great cooling scarf I highly recommend this one!! I think I’ll have to order another for Ben.